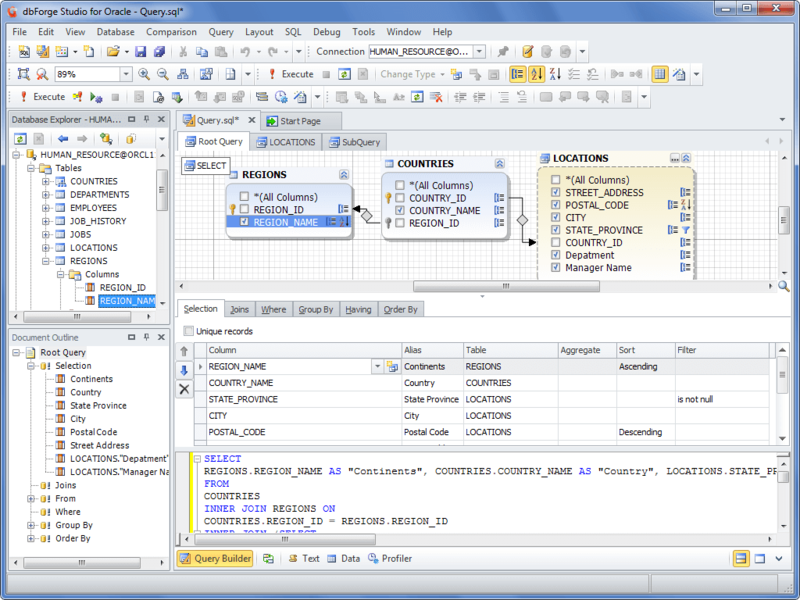 Experience the true power of Oracle Query Builder - a flexible Oracle SQL query creation tool for visual designing any queries you need, provided by dbForge Studio for Oracle. You can easily build SELECT statements with multiple tables, joins, conditions, and subqueries without manual typing of code. Add your subqueries to any part of the main query and create complex condition with expression builder. You can create any query visually by simply clicking the button on the toolbar to open a query document in the Oracle Query builder tool. 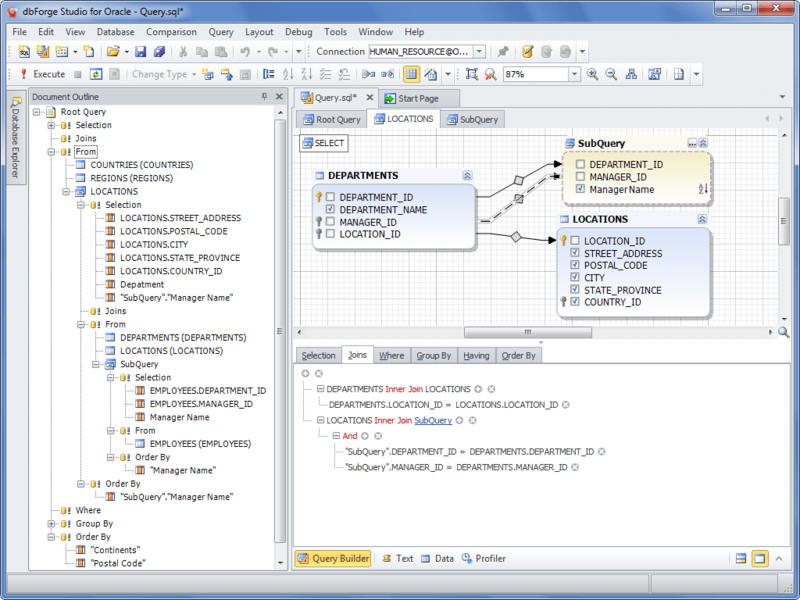 Query document contains the diagram and the tabbed editor. Editing selected statements can be done both ways - visually with Query Builder for Oracle and using SQL editor. When you switch from your SQL document view to Text view, all changes are applied to the query text in SQL Editor. When you change the code of your selected statement, you can return to view and inspect these changes in visual mode. 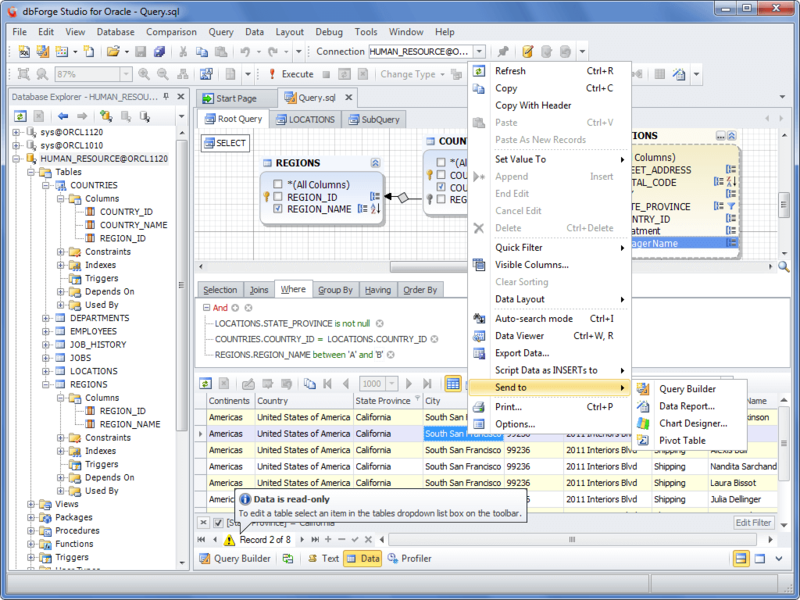 The same is when using Oracle Query Builder dialog box - you can switch between the Query Builder for Oracle interface elements and SQL editor in the lower right part of the dialog. 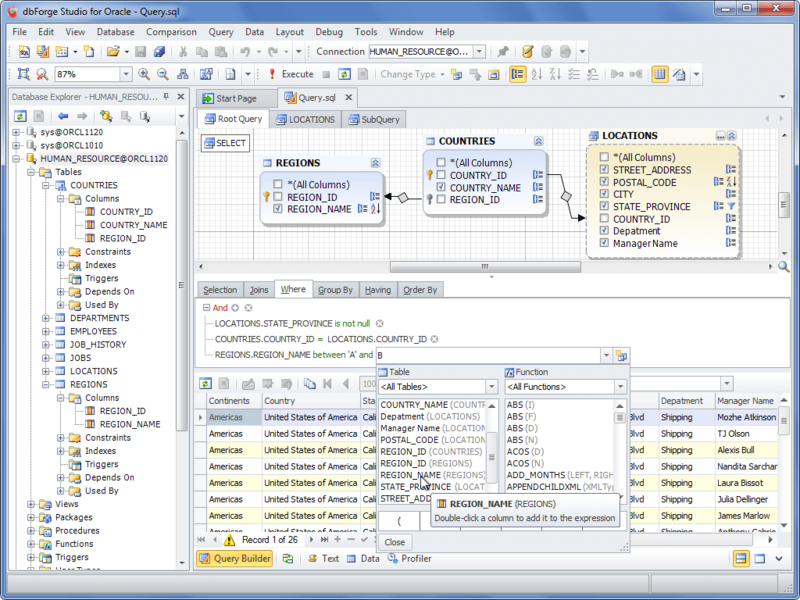 dbForge Studio for Oracle offers full support for subqueries in all SELECT statement clauses. With the query tool for Oracle, you can create sequence of queries of any complexity - each subquery can have its own subqueries. When you create a subquery using Oracle Query Builder or open it for visual editing, a subquery tab of the query document appears. These tabs allow navigating subqueries easily . You can navigate to the upper-level query from the subquery with the Parent Query button on the Oracle Query Builder toolbar. You can also use the Document Outline window to navigate the complex queries. Surely, you used to scroll up and down large queries in ordinary SQL editors to find the statement you needed to view or modify. Now there is no need in doing that kind of thing! 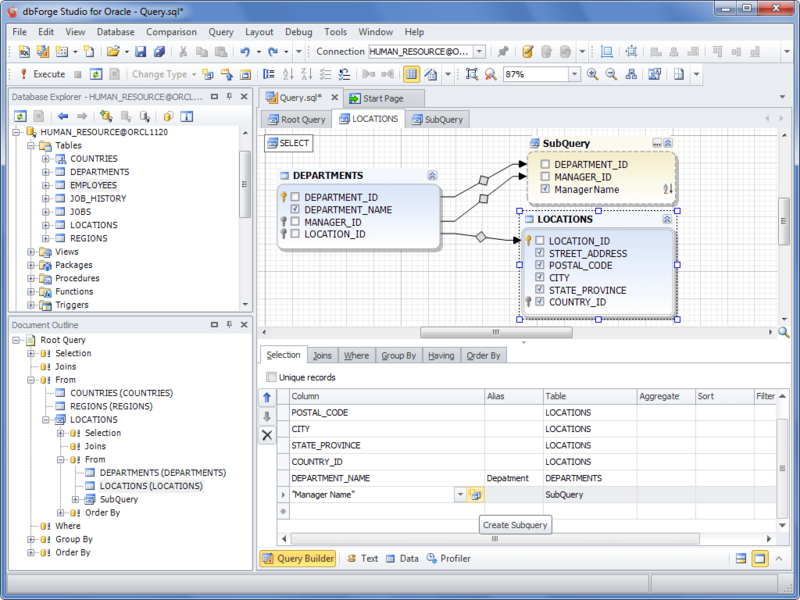 Query tool for Oracle, provided by dbForge Studio, has Document Outline window that shows the structure of your query as a neat tree. Just click on the node and you will be shown the corresponding tab in the document view. When creating logical statements, one should be very careful in order to avoid mistakes. It's a very difficult task if you have to accomplish it manually. But with a visual tool it becomes a pleasure. Create statements of any complexity with Oracle Query Builder Expression editor and enjoy error-free code. After executing a query, you can start working with the results you get right away. Using Oracle query tool supplied with dbForge Studio, you can edit data in the result grid and perform such actions as data export, sending data to report designer to create a report, chart designer, etc. 1 The number of tables in a query is limited to three, subqueries are not supported.